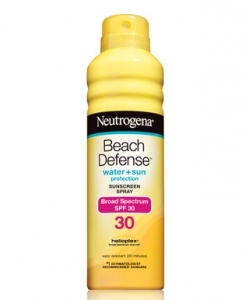 Neutrogena® Beach Defense® Sunscreen Spray provides superior skin protection from harsh summer elements, clinically proven to help defend the signs of sun damage. Beach Defense® Sunscreen Spray provides beach strength broad spectrum UVA/UVB sun protection in a lightweight, fast absorbing mist, ideal for outdoor skin protection of the active family. Avobenzone (3%). Homosalate (8%). Octisalate (4%). Octocrylene (2%). Oxybenzone (5%). alcohol denat., isobutane, dimethicone, acrylates/octylacrylamide copolymer, trisiloxane, diethylhexyl 2,6-naphthalate, tocopheryl acetate, fragance.